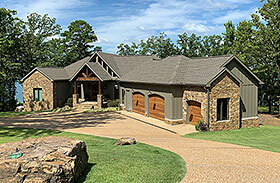 This designer adds rustic flair to this luxury house plan in his exclusive collection. The front exterior is elegant and rustic. However, the rear exterior will blow you away. The use of large windows, stone, siding, and timber posts combine to create a striking appearance. Inside you will find over 5000 square feet including 4 bedrooms, 4 and half baths, a bunk room for additional guest quarters, a spacious game room, and a hobby room. Outdoor living space is equally abundant with this house plan, too, with space available both on the main and walkout basement levels.